With their mounties, maple syrup, free health care and national sport, Canada seems like a pretty cool place. You have whole states provinces dedicated to a former ruling nation, the hockey hall of fame, Niagara Falls and loonies/two-nies. Canada also gave us Michael J Fox, Wayne Gretzky, Dan Aykroyd, Kids in the Hall, Fergie Jenkins, Rush, Todd McFarlane, Bronko Nagurski and a host of other wonderful and beautiful people. Your beauty is no mystery. Then again, Canada did release Celine Dion, Bieber and crazy anti vaxxer Jim Carrey. So you hosers owe us for those nut jobs. There are a few people I send and receive cards from in the hat of American. The most frequent packages flow back and forth from me to DJ at Sportscards from The Dollar Store. I'm jealous of some of the discount boxes he gets his hands on. Luckily, some of his purchases become part of NAFTA trading, as these two recent packages show. Sox box entries for these three. I was so hoping when Thome arrived he would help us get back to the World Series to put a ring on his finger. It wasn't to be. DJ is my biggest sender of Blackhawks. Dang near every package will have some, and this was no different. Stosh is always welcome at 2x3 headquarters, as is 2 time Stanley Cup champion Crow. And dig that Secord. I never realized how much Al Secord looked like one of the Sutter brothers. Duane in fact. Weird too that the number looks like a 16 when Al wore 20. Nice uncorrected error in the '90 Bowman with the wrong photo on the card. Lastly was this sweet relic of Goulet. 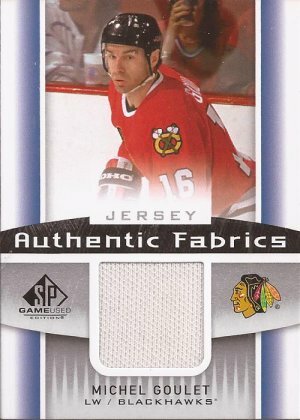 Michel finished out a nice career at the Chicago Stadium, though it was cut short with a nasty concussion. Still, hockey HOF'er and a number retired by the Nords. Package #2 from DJ contained zero hockey. No biggie, though, because it was awesome like they always are. 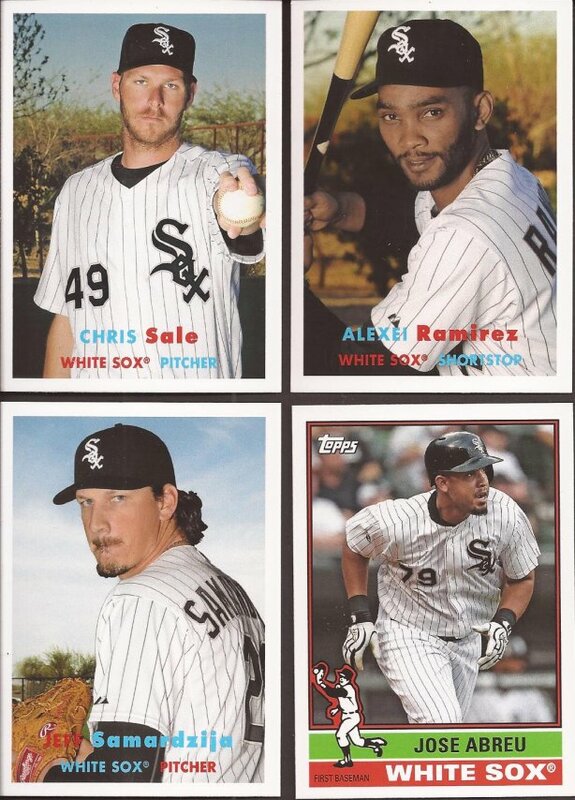 If I recall, an almost complete Archives Sox team set was in the package. Alexei looks 14 in the photo. And then these two came out. 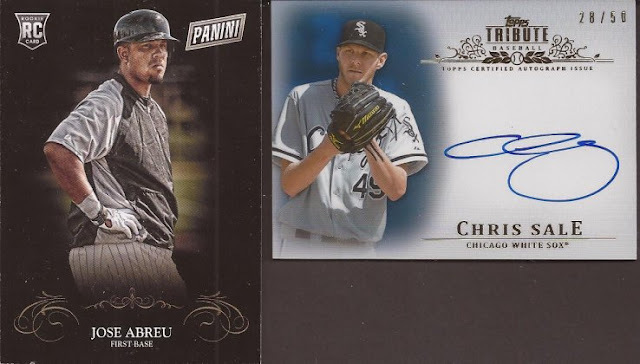 A Black Friday card of Abreu would have been the star of the package, until the on card auto of Sale showed it's face. This is my third Sale, but the other two are sticker autographs, so I am super glad to add one that is on card. DJ, much thanks as always. I'm working a stack for you, but it's a little off from mailing just yet. And thank you for being much more like Mario Lemieux and far less like Avril Lavigne. don't anger us or we'll burn down your white house again. we'll apologize afterwards..... but we'll still do it. Wow. Weird Al is still performing? Just discovered there's a Weird Al Yankovic trading card set out there. Ironically... I collect just about everything out there, but have very little desire to chase down these cards. On the other hand... it looks like he has an autograph in a My Little Pony set. That'd be pretty cool to own.